My whole family says that these are the best barbecued ribs that they’ve ever had! 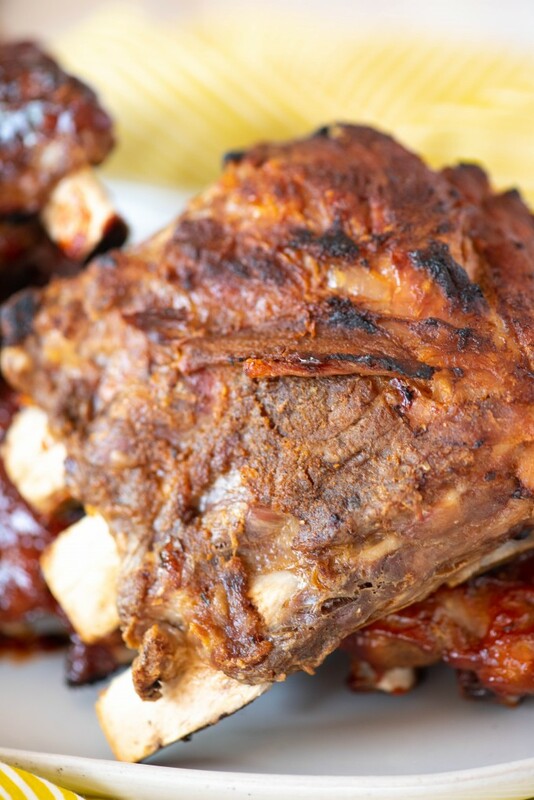 I’ll never make ribs another way again other than in my pressure cooker- thanks to the Instant Pot, these Instant Pot Ribs are “fall off the bone” tender! Dave and I have a long running joke with his sister and her husband. 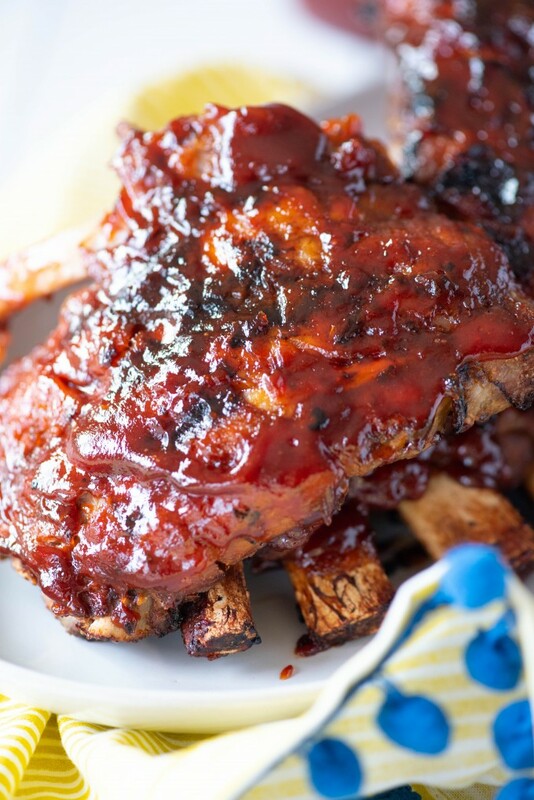 Technically, we probably have several thousand, but one of our longest running (and favorite) is about barbecued ribs. When Dave’s dad finds a restaurant he likes, he’s all in on it. He’ll go there several times a week, and nowhere else. In one of these restaurant phases, he found a restaurant that served ribs on Saturday nights. This went on for weeks. Not to all of us as a group, but individually. Over and over. This was back when we lived in Florida, so by the time we were in town to go there, this had gone on for many weeks. The four of us could barely keep it together at the dinner table as we were all instructed to order ribs. Anyway, the joke of the “fall off the bone” ribs has never died, even though this was probably at least three years ago. I love making ribs when I’m cooking for a large group of people- they require very little work from me, leaving me time to prepare sides, hang out, etc. Ribs were the second thing I ever made in my instant pot. I didn’t have a great success with the chicken I made the first time (reading the instruction manual tends to help, what a shocker), so I decided to try using the pressure cooker to make ribs on Labor Day for about 20 people. They were phenomenal, and it reinvigorated the “fall off the bone (FOTB)” joke all over again- because they really DID fall off the bone! Everyone absolutely raved about them, with almost everyone saying that they were the best they’d ever had and Dave’s dad commenting that they were better than any ribs he’d had at a restaurant. My beloved sister in law doesn’t like sauce on her ribs, so I usually throw some on the grill with just the dry rub seasoning on them. Here’s the thing about doin ribs in the slow cooker or pressure cooker if you don’t sauce your ribs- you need to be SUPER GENEROUS with your seasoning, and I also recommend letting them sit with the dry rub on them for at least two hours, but preferably several hours. I also think that they benefit from being basted with the juices from the instant pot insert- it adds some flavor and moisture back to them. For the liquid in the pot- you can use water instead of the beef stock/broth if you prefer. I’ve also used beer with marvelous results. Don’t skip the liquid smoke- you can usually find it where the barbecue sauce/Worcestershire sauce is. It really adds a nice dimension of flavor to them. An Instant Pot or other pressure cooker– obviously. 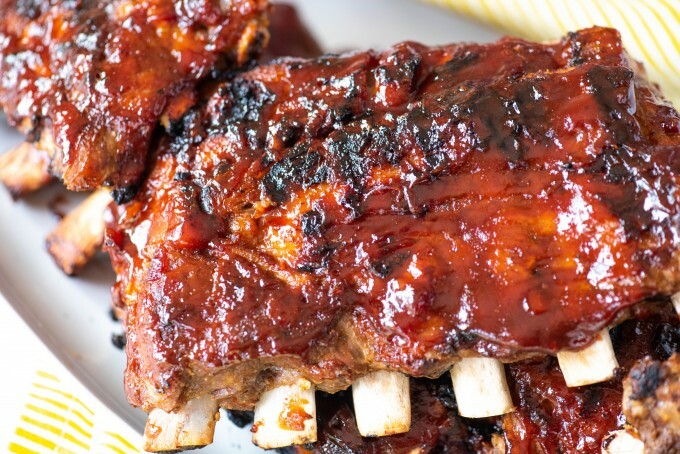 I use a large 8 qt Instant Pot when I make these, and it JUST fits 3 racks of ribs. Basting brush– for brushing on sauce. 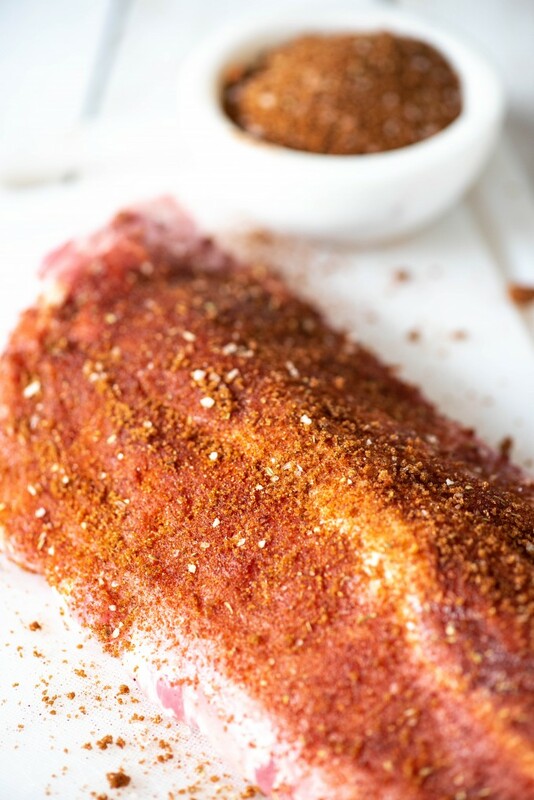 Weber Kansas City BBQ Rub– I am in LOVE with this dry rub seasoning and use it on almost everything that I grill in the summer. I buy mine at Sam’s Club, but if you’re not a member, you can also buy it on Amazon. If you don’t want to do that, I’ve copycatted it as best I could below. I still think Weber’s is better. 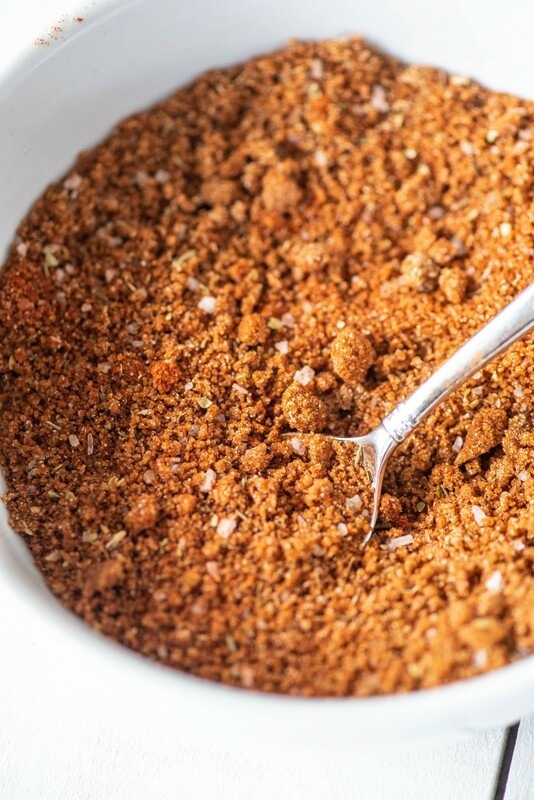 Create the dry rub- in a small bowl, stir together the brown sugar, oregano, chili powder, paprika, salt, onion powder, garlic powder and cayenne. Rub the ribs generously, front and back. 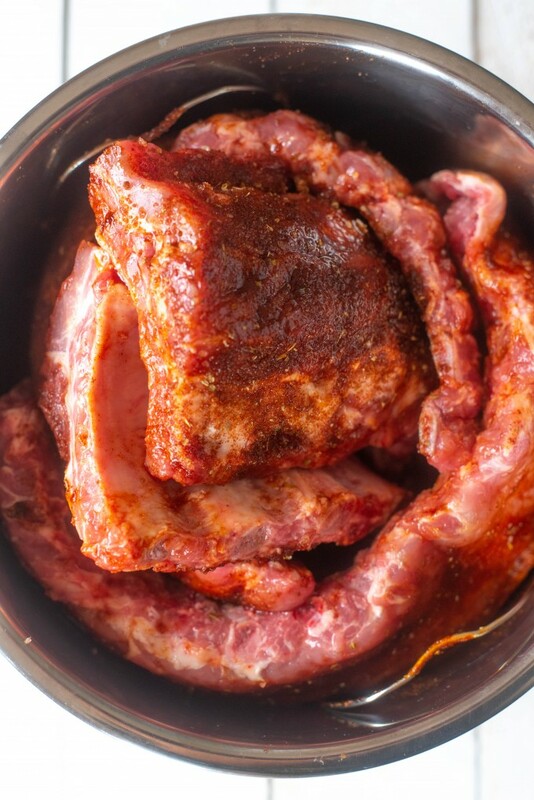 If not using barbecue sauce, wrap the ribs in Saran Wrap and refrigerate for at least 2 hours, or overnight. 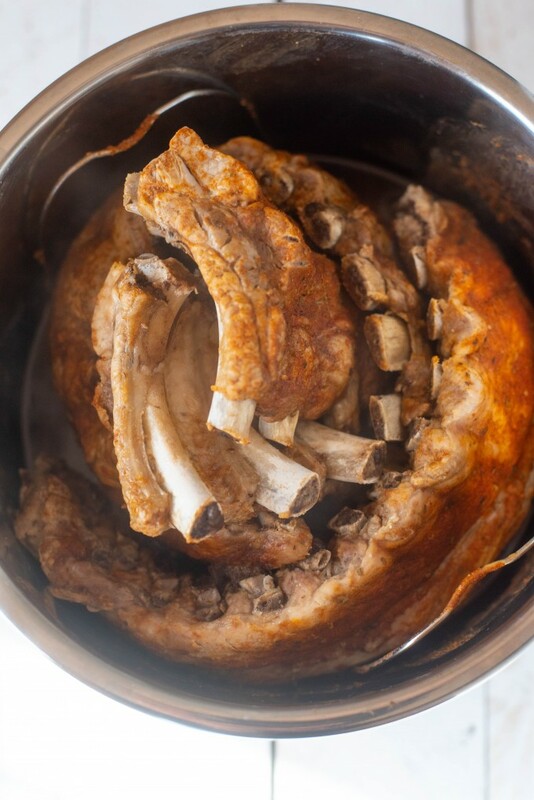 Pour the beef broth, vinegar and liquid smoke into the insert of the Instant Pot, and set the rack inside. Fit the ribs inside the pot, then cover and set top valve to "seal." Set the machine to cook on the "Meat" setting for 40 minutes. When timer has run out, naturally release for 10 minutes, the quick release to finish. Preheat a grill to medium heat and lightly oil the grates. 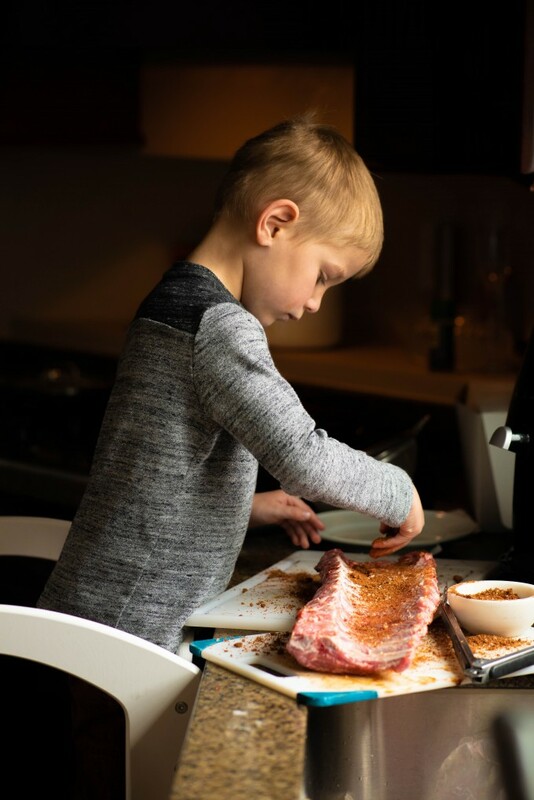 Carefully remove the cooked ribs from the Instant Pot, and place on grill. Baste with chosen barbecue sauce. After 3-4 minutes. turn the ribs over and repeat on the following side. I usually do this twice on each side. (Conversely, you could also use your oven's broiler for this step). what barbecue do you use? I’m always a fan of Sweet Baby Ray’s. THANK YOU!!! Finally someone who must get the same cryo pack ribs I get that only come in 3 racks per pack. I am glad to read the 8qt can do this and just ordered it up!